All vehicle trips begin with the start-up of the engine, travel to a desired location, parking the vehicle, and then turning off the engine. With the exception of electric vehicles, emissions are produced in varying amounts throughout the entire operation of the vehicle. The purpose of this section is to review approaches that can be used to estimate these vehicle emissions. Currently, virtually all on-road vehicles are powered by internal combustion engines that are fueled with gasoline, diesel fuel, natural gas, propane, or ethanol. There are a few vehicles that run on batteries and hydrogen, but there are so few at this point in time that, they have no significant impact on urban or regional emissions anywhere in the world. Hopefully, this will change in the future. The discussions in this section are directed toward the estimation of emissions from the more common internal combustion engine. Electric vehicles of course have no impact at the point of use and are typically treated as zero emissions. If large numbers of electric vehicles are anticipated, the increased emissions in power plants need to be taken into consideration. However, these emissions become a stationary source concern rather than an on-road emissions concern. Emissions from on-road vehicles come in four forms. The primary source of emissions is the exhaust of the vehicle engine itself. The brake shoes create a second source of particulate matter emissions, the tires create a third source of particulate matter emissions, and fuel evaporation creates a fourth source of hydrocarbon emissions. Each of these four sources of vehicle emissions will be discussed in this section. Figure 6.2.1-1 represents a simplified illustration of the combustion process in an internal combustion engine. As shown in figure 6.2.1-1, air and fuel are introduced into the engine and combusted. The expansion of gases due to the combustion drives the engine, and the gases from the combustion process are exhausted, sometimes through a control device, such as a catalyst. In effect, the engine exhaust is created as a byproduct of a chemical reaction between oxygen in the air and the carbon, hydrogen, sulfur, and other oxidizable content of the fuel. The primary constituents of exhaust gas are carbon dioxide (CO2), water (H2O), unburned or altered hydrocarbons (HC), particulates resulting from partially combusted hydrocarbons, and carbon monoxide (CO). Since the earth’s air is 70% nitrogen, and the fuel itself may carry some nitrogen, there is a considerable amount of nitrogen in the combustion chamber that is being heated and compressed as the fuel is combusted. This leads to the production of nitrogen oxide (NO), nitrogen dioxide (NO2), nitrous oxide (N2O) and other nitrogen compounds, which are exhausted along with the other gases. Internal combustion engines are commonly classified by the way the fuel in the combustion chamber is ignited. Gasoline fueled engines depend upon a sparkplug to ignite the fuel while diesel fueled engines depend upon the heating due to compression of the air and fuel mixture to ignite the fuel. The former is typically referred to as spark-ignited and the latter as compression-ignited engines. It is easy to think of the combustion process as a steady-state process that produces a consistent output of exhaust gases. This is, of course, not true. Vehicles are continuously speeding up and slowing down, and the amount of exhaust flow will change accordingly. The ratio of air to fuel is often changing, which changes the rate of formation of the various exhaust components. The variability of the makeup of chemicals and temperatures in the exhaust also impacts the formation of pollutants as well as the efficiency of any control devices. Thus, as a vehicle operates on a road, the emissions are continuously changing and are dependent on multiple factors. 6.2.1-2 presents the result of measurements of second by second carbon monoxide emissions and speeds from a typical modern gasoline fueled vehicle operating on a normal roadway. As can be seen, emissions vary considerably as the vehicle goes about its route. The amount of any chemical that is formed in the combustion chamber depends upon the relative number of molecules participating in the reactions along with the temperature and pressure that exists during the reactions, and the reaction rates of the various constituents of the mixture. Equation 6.2.1-3 is a typical chemical balance equation representing the main reaction process during combustion for fossil fuels. It is common for m = 1.6 to 2.2 times n.
In the case of equation 6.2.1-3, if n is taken to be 10 and m is taken to be 18 (gasoline) and it is assumed, for the moment, that e, f, g, h, i and j are zero (i.e. to achieve perfect combustion with only water and carbon dioxide formed), then to provide just enough oxygen for the carbon and hydrogen in the fuel, b must be equal to 14.5 times a. Another way to say this is that for each molecule of fuel, 14.5 molecules of oxygen are needed to perfectly burn the fuel to carbon dioxide and water. Air is not pure oxygen, however. To supply 14.5 oxygen molecules using air, 54.23 nitrogen molecules also enter the combustion chamber since air is about 78% nitrogen and only 21% oxygen. This means that 68.73 molecules of air enter the combustion chamber for each molecule of fuel in this example. If this is calculated as mass rather than molecule number (volume), the mass of air to fuel will be 14.5 to 1 in the case of the fuel under discussion when only water and carbon dioxide are being produced. It is a quirk of nature that the perfect air to fuel ratio for gasoline type fuels is almost the same when calculated in terms of mass as the oxygen to fuel ratio when calculated in terms of volume. This perfect ratio of oxygen molecules to fuel molecules is called stoichiometric combustion and is often referred to when discussing internal engine combustion. The ratio of air to fuel in an engine compared to the stoichiometric amount is referred to as the “Lambda” of the mixture in most discussions of engine combustion. 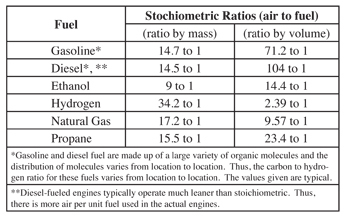 If the mixture has greater fuel to air compared to the stoichiometric mixture then the Lambda of the engine is less than one and the engine is referred to as running “rich.” On the other hand, if the mixture has more air relative to the fuel compared to the stoichiometric mixture then the Lambda of the engine is greater than one and the engine is referred to as running “lean.” It is also apparent from equation 6.2.1-3 that the more fuel molecules combusting in the engine (i.e. the larger the term a) then the more emissions that will be produced (i.e. the larger c, d, e, etc…). In other words, larger vehicles will tend to produce more emissions since they are using more fuel; although, smaller vehicles with problematic air/fuel ratios and little control can produce more emissions than larger well controlled vehicles. The amount of CO, CH1.8, HC, and NOx in the exhaust gases resulting from imperfect combustion of fossil fuels depends upon the amount of air compared to fuel (Lambda), reaction rates, combustion temperatures, and pressures during combustion. While reaction rates are a known quantity for almost all components of today’s fuels, the other factors vary continuously. The temperature and pressure are dependent upon the design of the engine, the compression ratio of the engine, and the timing of the combustion in the engine relative to engine valve open and closure. The air to fuel ratio depends upon the design of the air and fuel supply system for the vehicle. 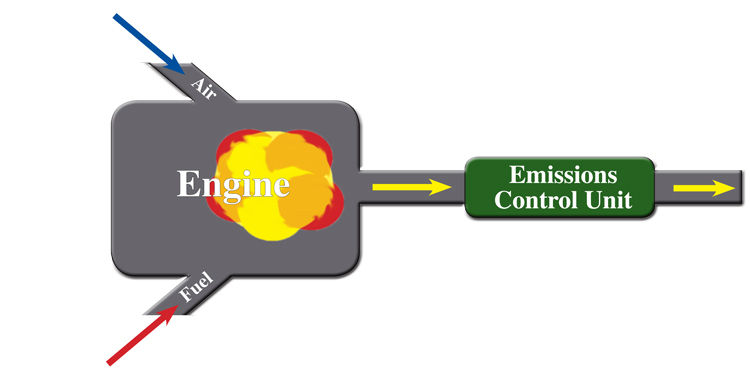 Figure 6.2.1-4 illustrates the impact of the air to fuel ratio on the emissions from an internal combustion engine. This graphic was derived from a graph presented in the Automotive Handbook 5th Edition published by Robert Bosch, 2000. The air/fuel ratio data in 6.2.1-4 is presented in terms of Lambda. As discussed earlier, a Lambda of 1 means the air/fuel mixture is stoichiometric. As can be seen, CO shows the most variation as the Lambda changes, although, the other compounds vary considerably as well. The optimum air/fuel ratio to reduce emissions is close to 1.0 as would be expected. However, to maximize the efficiency of added control equipment, it is often desirable to operate the engine either rich or lean depending upon the needs of the control equipment or to increase engine efficiency. In the case of diesel fueled compression ignited engines, they are always operated very lean. Diesel fuel, Natural gas, ethanol, and propane are the most important fuels for on-road vehicles in today’s fleet. 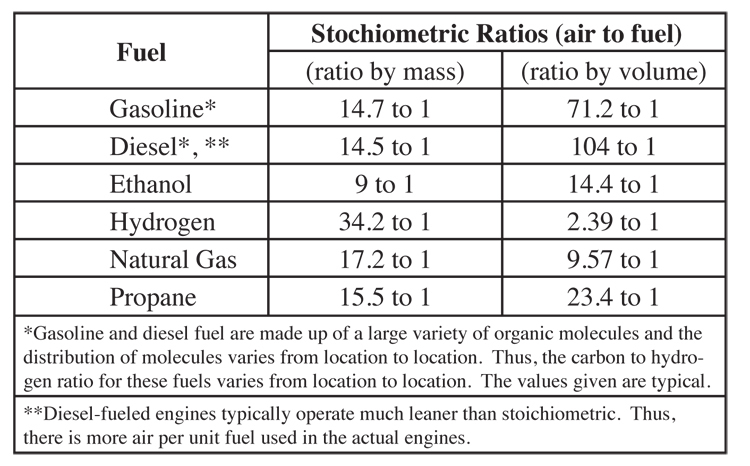 The typical stoichiometric air/fuel ratios for the most common on-road vehicle fuels today are shown in table 6.2.1-5. 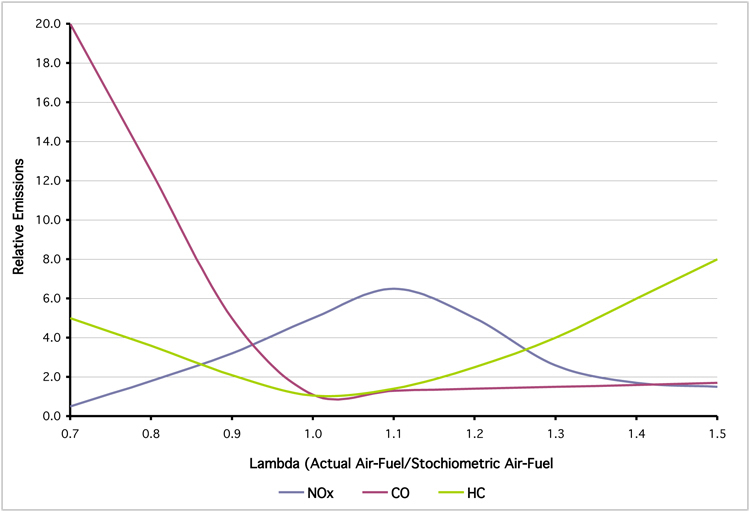 As previously discussed, one of the most important factors in minimizing emissions produced in a gasoline fueled engine is maintaining the air/fuel ratio close to a stoichiometric condition. This air fuel ratio in a vehicle is controlled by the fuel injection system. The fuel injection system will introduce a certain amount of fuel into the air stream before each combustion cycle. The fuel injection system does not need to be complex for an engine that always operates in steady state condition. However, vehicles operate in a continuous state of change, accelerating and decelerating, and changing the flow rate of air into the combustion chamber all of the time. This requires the fuel injection system to vary the amount of fuel needed to keep the air/fuel ratio at the desired value. There are several types of fuel injection systems that are found in vehicles, ranging from mechanical systems to very quick, precise electronic systems. 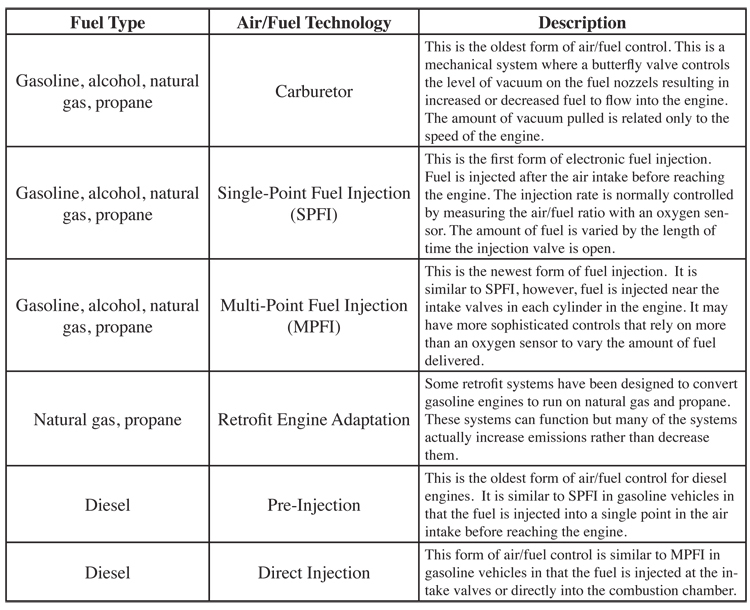 Table 6.2.1-6 indicates the broad categories of air/fuel engine technologies that are in use today. Most modern gasoline vehicles include emission control systems as part of the vehicle design. They typically fall into two categories, combustion modifications and after-treatment. Combustion modifications alter the environment during the combustion of the fuel in the engine to minimize the production of pollutants, whereas after-treatment refers to the removal of pollutants in the exhaust stream, post combustion. One popular type of control used to change the environment in the combustion chamber is called Exhaust Gas Recirculation (EGR). EGR sends a portion of the exhaust stream back through the air system to the combustion chamber. Although the exhaust stream is at a higher temperature compared to the intake air, the effect of EGR is actually to lower the temperature in the combustion chamber. This happens because the exhaust gas does not have oxygen. Thus to have enough oxygen for combustion, more air, plus exhaust gas, must be introduced to the combustion chamber for the same amount of fuel. This lowers the chamber temperature. Very high temperatures increase the rate of the chemical reaction that forms nitrogen oxides (NOx). Therefore, EGR is used to lower the peak temperatures occurring in the combustion chamber to minimize the formation of NOx. One of the most effective and widely used combustion modification is improved fuel delivery systems, such as MPFI and direct injection systems, as described earlier in this section. These electronically controlled systems can sense important engine parameters, including the temperature, the power needed, and exhaust oxygen levels to determine the exact amount of fuel needed to keep the engine operating at the optimum condition. As the electronic fuel system has advanced, these controls can respond so quickly and accurately to the combustion environment that the engine can operate at stoichiometric conditions virtually 100% of the time, which significantly reduces the production of pollutants. Catalytic control systems are the most common method for reducing emissions of CO, NOx, and VOCs in the exhaust stream. Platinum, rhodium, and other metals are used as substrates in ceramic or metal matrices to provide a surface where pollutants in the gas stream react to form carbon dioxide, water, and nitrogen. Catalysts are passive and low-maintenance systems, however, some chemicals, such as sulfur and lead, as well as extremely hot temperatures can ruin the catalyst. Catalysts do not work until they reach a certain operating temperature, which is generally called the ‘light-off’ temperature. The light-off temperature of a specific catalyst depends upon its design and components. The time to reach light-off depends upon the temperature of the engine and catalyst at the time that the engine starts, how the engine is operated after starting, the ambient temperature, and the proximity of the catalyst to the engine. The exhaust as it first exits the combustion chamber is tens of degrees hotter than further down the tailpipe. Catalysts positioned here are called ‘close-coupled’ catalysts and they are able to light-off much quicker than downstream catalysts. The primary function of closer-coupled catalysts is to reduce start up emissions. However, as the engine heats up, a typical catalyst would be ruined by the extreme heat at the exit of the combustion chamber. Therefore, the close-coupled catalysts are made of more durable metals and are more expensive than normal downstream catalysts. Because catalysts are so effective, reducing 99+% of the pollutants in the exhaust stream, the emissions profile of a vehicle before the catalyst ‘lights off’ is extremely different than the emissions after the catalyst is working. For the purposes of measuring and keeping track of the overall emissions from a vehicle, it is most useful to separate these two conditions. Therefore, most inventories have “Start” emissions, and “Running Emissions”. The running emissions occur during the normal operation of a vehicle once the operating temperature of both the engine and catalyst have been reached. This temperature will vary depending on the vehicle and environment in which the vehicle is being driven. Start emissions from non-catalyst vehicles certainly have less distinction from running emissions than do a catalyst-equipped vehicle; however the emissions profile is still slightly different due to the engine’s operation during start conditions when the engine is cold. Cold engines usually are designed to run slightly off stoichiometric conditions, slightly rich, to help keep the engine running. So both a catalyst-equipped and non-catalyst vehicle will have different start emissions, due to operational differences in the engine. For simplicities sake, most test methods specify a set length of time on a set cycle that is defined as ‘start’ emissions. For a normal catalyst, it typically takes a minute or two for the engine to warm up and one to five minutes for a typical catalyst light-off and a few more seconds to reach full efficiency. Common start methodologies have chosen anywhere between 200-500 seconds as the definition of where ‘start’ emissions end and ‘running’ emissions begin. One of the largest impacts on the light off time for a catalyst is the engine and catalyst temperature at the time of ignition. The hotter the engine and catalyst are at the time of ignition, the less time it will take for the catalyst to reach its light off temperature. Therefore, vehicle emissions inventories categorize the start emissions as a function of engine and catalyst beginning temperature. Since this temperature is difficult to measure, a surrogate that is more easily determined is the length of time the vehicle has sat un-operated. This amount of time is called ‘soak time’, referring to the time the engine has soaked, or sat, before ignition. As the soak time increases, the start emissions also increase. An engine/catalyst that is at ambient temperature before starting, which is assumed to occur only after 12-18 hours of soak time, is called a cold start. 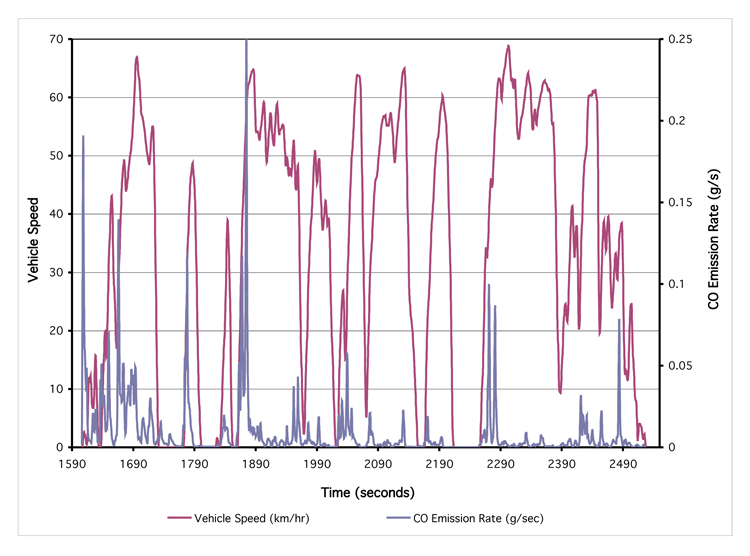 Figure 6.2.1-7 shows CO and NO emissions from a gasoline fueled vehicle for 400+ seconds after a complete cold start at 20°C. As can be seen in figure 6.2.1-7, emissions after 200 seconds are much lower for this catalyst controlled vehicle. Because of the impact of start emissions on the inventory, it is necessary to collect information on the number of starts and the soak time of each start. Many persons underestimate the number of starts that they make each day. It is common for drivers to believe that they start their vehicles only two times per day—once in the morning and once in the afternoon. The reality is much different. Measurements made by ISSRC in over 10 countries indicate that the typical driver starts their vehicle 6-8 times per day. In the United States, the California Air Resources Board has found that the average driver starts their vehicle 6.56 times per day (EMFAC, http://www.arb.ca.gov/msei/onroad/doctable_test.htm, chapter 7.6.2). The most common form of after-treatment for particulate (PM) emissions are filters. Filters are most commonly used on diesel vehicles and can reduce PM up to 95%. The more advanced filters use catalyst materials and can ‘regenerate’ themselves and therefore require minimal maintenance and replacement. Filters come typically in two forms. One form is a traditional replaceable filter element that must be changed when the pressure drop across the filter becomes excessive. In the case of these passive filters, the engine performance problems induced by a clogged filter is normally adequate to result in its replacement. There is some concern, however, that the user might remove it and operate the equipment without the filter element. In estimating emissions based on this type of filter, it might be prudent to allow for a certain fraction of equipment failure for cases where the operator simply removes the filter and then attempts to operate the equipment without it in spite of warning lights on the engine. The second form of filter is a catalytic filter that collects particles and then regenerates itself by burning the particles off of the filter plates. This type of filter does not require periodic replacement, but does release a small amount of particulate matter during the regeneration process. Both types of filters are capable of achieving overall 95% emission reduction for particulate matter; however, some older engine designs do not work well with these types of filters. A Diesel Oxidation Catalyst (DOC) is also an option for reducing particulate emissions especially in the case of older diesel engines that cannot use the passive or active filters. The DOC operates in many ways like the two-way catalyst that is used on older gasoline vehicles. It burns (oxidizes) the hydrocarbon and carbon monoxide emissions exhausted by the engine. Since some of the diesel particulates are a type of hydrocarbon, the DOC can destroy these forms of particulate matter. The amount of diesel particulate exhaust that is in the form of a hydrocarbon varies depending upon engine operating parameters, but is typically in the 30% to 45% range. Thus, a DOC can reduce particulate emissions on the order of 30% to 40%. The DOC also reduces the carbon monoxide and gaseous hydrocarbons in the exhaust by up to 90%. The DOC will in some cases also oxidize the sulfur in the fuel turning it into particulate sulfates resulting in an actual increase in exhaust particulate matter if the fuel contains significant sulfur. Thus, DOC emission reductions directly at the tailpipe can actually increase as well as decrease. It can be argued that the sulfur in the fuel will eventually become a particulate so that the increase in exhaust particulate matter should be ignored. However, the location of the sulfates will be changed dramatically with the use of a DOC with high sulfur fuel. All presently available after-control for NOx involves the use of a catalyst and the addition of a chemical reducing agent, such as urea or ammonia, to the exhaust plume ahead of the catalyst. The urea is typically supplied as a water solution, which is injected into the exhaust plume. Ammonia is more often used as a compressed gas. If the reducing agent becomes depleted then the NOx control device will not work. This is one of the criticisms of the present NOx control devices; however, manufacturers have developed methods to detect the absence of a reducing agent. When the reducing agent is absent the engine is designed to operate in a less efficient mode that should stimulate the operator to add the needed reducing agent. However, for purposes of estimating emissions from the use of these types of control equipment, it should be considered that a small fraction of the control equipment will be operated without the catalyst functioning properly. In addition for the NOx catalyst to operate effectively, the exhaust must reach certain minimum temperatures. Some operating modes and engine designs can create problems by not reaching the necessary temperatures. While this is primarily an issue of the application of the control equipment to a specific system, this fact should be considered in making emission reduction estimates particularly in the case of retrofit equipment. In addition, some after-control devices can impose a fuel penalty, which would need to be taken into account for CO2 and other emissions. 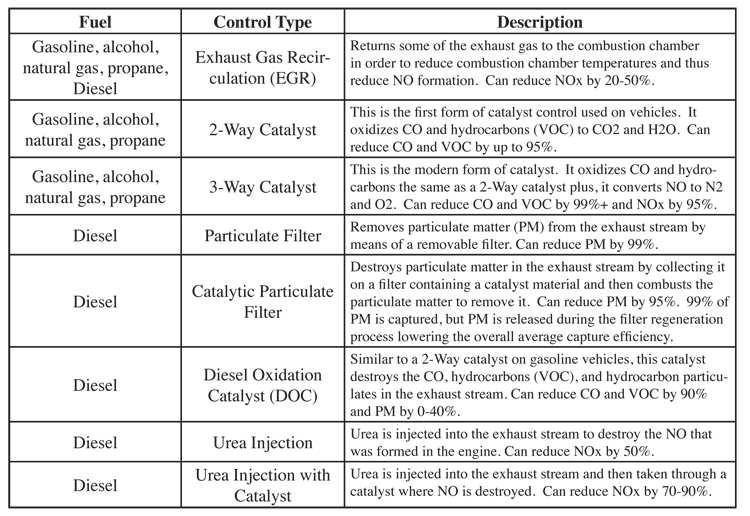 Table 6.2.1-8 summarizes the control systems being applied to gasoline and diesel vehicles to reduce exhaust gas emissions. Evaporative emissions are another class of emissions that must be considered in any emissions inventory, since the VOC emissions can be higher than the tailpipe emissions in some gasoline vehicles. Evaporative emissions are volatilized fuel released from the fuel tank of the vehicle and also from the engine and fuel injection system of the vehicle, and because they are from evaporation and not combustion processes, are only in the form of VOC. Evaporative emissions come from gasoline and ethanol fuels, whereas there are no significant evaporative emissions from diesel fuels because of the low volatility rate of the fuel. Evaporative emissions from the fuel tank are often referred to as resting losses. The fuel tanks of gasoline and ethanol vehicles are non-pressurized, and usually are accessed via a cap that can be screwed on. This means that there is the opportunity for significant amounts of evaporation into the air as temperatures change throughout the day and when the cap is removed for refueling. Many modern fuel tanks and the associated fuel delivery systems are designed to reduce the rate of evaporation. Laws in the United States require fuel system evaporative controls to seal the system, and some of these systems have demonstrated almost no evaporative emissions. Some locations in the United States require the refueling systems to collect and store emissions during refueling operations. This is discussed in subsequent paragraphs. The amount of evaporation of a given fuel at a given temperature is determined by the volatility of the fuel. The volatility of a fuel is measured in terms of vapor pressure at normal operating conditions. This pressure is referred to as Reid Vapor Pressure (RVP) and in the U.S. is measured in pounds per square inch (psi). Reid Vapor Pressure is the pressure measured over gasoline when the gasoline and measurement chamber are at 100 degrees Fahrenheit (37.8 degrees Celsius). Evaporation, of course, increases as the ambient temperature increases and so is much worse during warmer times of the year. Many locations have set standards for the vapor pressure allowed for vehicle fuels. Table 6.2.1-9 shows some of the summertime limits found in the United States. Fuel vapor pressure can also impact exhaust emissions but only limited research is available on this topic (Shih, 1990). Evaporative emissions can also occur through engine seals and through the oil reservoir. One of the earliest forms of vehicle evaporative control in the United States was the collection of vapors from the oil reservoir and their return to the engine through the air intake. This is referred to as positive crankcase ventilation (PCV), which is summarized in 6.2.1-10. Most vehicles worldwide have some form of PCV. In recent years, tunnel studies have raised the possibility of significant evaporative emissions through very small, normally unnoticeable, leaks in engine seals. Manufacturers have improved engine seals in the United States since 2000 due to this problem. Little is known about this leak process, but it is worth noting. An extremely important case where significant evaporative emissions occur is at the time of vehicle refueling. These are called refueling emissions, and are not usually counted as a mobile source emissions source, rather as part of the area source inventory as part of the refueling station emissions, and will be discussed further in the Stationary Source Chapter. In this case emissions are a result of fuel entering the fuel tank displacing the vapors of the fuel tank. Without any control, the fully fuel saturated air in the fuel tank is forced into the atmosphere. Many urban areas in the United States require these emissions to be captured into the filling hose as the tank is being filled. It should be noted that while fuels such as natural gas and propane are housed in sealed tanks, the process of refueling those tanks can have significant emissions, and it is also possible to develop small leaks in compressed gas systems as well. Liquid natural gas (LNG) has its own evaporation issues, which should be considered if LNG becomes a popular choice for fuels. In the earliest days of the introduction of the internal combustion engine, it was found that some gasoline burned too quickly (pre-ignited) causing virtual explosions in the engines that reduced efficiency and damaged engine parts. This phenomenon results in a knocking sound in the engine and is commonly referred to as “knocking”. Pre-ignition (knocking) becomes a bigger problem in gasoline engines that operate at higher temperatures and pressures. A fuel rating system was developed called the octane-rating. The name was selected because the hydrocarbon isooctane was used as the standard for developing the rating system. Pure isooctane was given a rating of 100. If a fuel produces engine knock at a temperature and pressure below that of isooctane it was given a rating of less than 100. Technically octane numbers up to 100 indicate the volumetric content in percent of C8H18 iso-octane contained in a mixture with C7H16 n-heptane at the point where the mixture’s knock-resistance in a test engine is identical to that of the fuel being tested (Bauer, 2000). It was found around 1920 in the United States that the addition of a compound called tetraethyl lead (TEL) dramatically increased the octane rating of a given fuel, allowing refiners tremendous flexibility for making high-octane fuels at a lower cost than using hydrocarbon compounds. However, as vehicle use increased and large amounts of TEL were exhausted in the air, TEL was linked to serious health problems including brain damage to children. TEL was subsequently labeled as a toxic compound in the 1980s in the United States and totally phased out of use in the 1990s. This is also the same time period when catalysts were introduced in the United States, and it was recognized that TEL in the fuel also destroys the ability of catalyst to work. Today, leaded fuel, as it is commonly called, is banned in most countries around the world, however TEL is still used in parts of Africa, the Middle East, and Central Asia. As an alternative to using TEL to raise the octane level of fuels, fuels are now reformulated with higher-octane hydrocarbons in most locations. For example, the addition of alcohol to gasoline increases its octane rating. In countries not wanting to make the investment in their refineries to reformulate their fuels, a compound called methylcyclopentadienyl manganese tricarbonyl (MMT) is being used or proposed to replace TEL. However, there is concern that MMT might have health risks associated with it as well as the potential to degrade control system performance. The use of MMT in fuels is not allowed in the United States for these reasons. In addition to the amount of fuel, temperature, and air/fuel ratio, fuel makeup can play an important role in changing the emissions characteristics of the engine. In an attempt to lower vehicle emissions, California pursued a course to introduce methanol into the fuel mix in the late 1980s. In response to this, the ARCO company (now part of BP Petroleum) developed a cleaner burning gasoline that they argued would result in engine combustion that is as clean as using methanol. This new gasoline involved the use of a slightly different mix of hydrocarbons in the fuel and the addition of Methyl tertiary-butyl ether (MTBE). These fuel changes did produce a fuel that burned cleaner than normal gasoline at the time demonstrating that it is possible to produce cleaner burning forms of gasoline. The simplified chemical formula for MTBE is C5H12O. The addition of MTBE to the fuel in effect added oxygen to the fuel mix. Thus, MTBE has been referred to as an oxygenate for purposes of discussing fuel additives. Methanol and Ethanol produce similar results as MTBE except that they increase the volatility of the fuel unless changes are made to the base fuel (see the subsection concerning evaporative emissions). Returning to 6.2.1-3, it is noteworthy that if the fuel were to be replaced with an oxygenated fuel that overall looked like C10H18O (i.e. the fuel contains about 10% oxygen by weight), then the fuel to air needed for stoichiometric combustion drops from 14.5 to 14. In an engine supplying air (thus oxygen) at a constant rate, such as a carbureted engine, then the air/fuel mixture would start to operate leaner than before (i.e. move to the right in 6.2.1-4) with the addition of an oxygenate. Since most engines tend to be set to run rich to give them more power and easier starting, the use of oxygenated fuel results in a leaner mix that will normally lower emissions. This is the basis for the use of oxygenated fuels as an emissions control measure in some locations. Oxygenated fuels were mandated for highly polluted cities in the United States in the 1990 U.S. Clean Air Act. 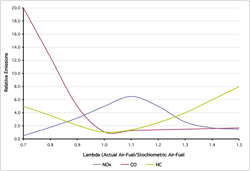 It has been argued that modern computer controlled vehicles with tailpipe oxygen sensors will not benefit from oxygenated fuels since they adjust the air/fuel mixture to maintain a constant Lambda. Tests on some of the earlier computer controlled engines did benefit from oxygenated fuel probably because the engine adjustments were not as precise as thought. However, computer controlled vehicles manufactured after 2000 in the United States do not seem to significantly benefit from oxygenated fuels confirming this earlier belief. Fleets in developing countries with large numbers of carbureted vehicles or with failed or older computer controlled air/fuel systems could benefit from the use of oxygenated fuels. It is valuable at this point to mention the ground water problems associated with MTBE. Unfortunately, MTBE is slightly water soluble due to the oxygen molecule in its construction. Thus, in the case of leaking gasoline tanks, which are common, the MTBE transfers into the ground water at a rapid rate. Thus MTBE became a ground water problem in many areas of the United States. Ultimately, MTBE was banned as a gasoline additive in the U.S. because of this problem. Ethanol has been substituted for MTBE as the oxygenate of choice in the U.S. Fuels made with shorter carbon chains and less complex structure tend to combust more cleanly than fuels with longer carbon chains and more complex structures. Thus methane (CH4) tends to combust more cleanly than methanol (CH3OH) which is easier to combust than gasoline (C10H20). This does not mean that methane burns cleaner than gasoline or methanol in every situation. An inappropriate air/fuel ratio in a natural gas fueled engine can produce more emissions than a carbureted gasoline fueled engine that is properly adjusted. Retrofit kits to convert gasoline fueled vehicles to natural gas fueled vehicles can produce high polluting vehicles in some cases. All fossil fuels contain some level of sulfur. When the fuels are burned, the sulfur is emitted through the tailpipe. Since sulfur dioxide is a hazard itself and converts to PM2.5 in time, the sulfur degrades the atmosphere. In addition, the sulfur inhibits the operation of the vehicle catalyst system as it moves through the exhaust. In California, fuel sulfur is being restricted to 15 ppm to protect catalyst and to allow NOx catalyst on diesel fueled vehicles. When brakes are applied, the friction between the brake pads and the brake shoes causes the brake pads to wear and eventually the pads need replacing. This wearing process produces particulates that should be considered when evaluating vehicle emissions. These particles are of different size distribution and composition than that from the combustion process. In the past, break pads were made of asbestos. This material is particularly hazardous and is not allowed in break shoes in developed countries. The status of asbestos in brake shoes in developing countries is unknown to the authors at this point in time. A similar process occurs with respect to tires. The tire tread that disappears as tires age is released as a particulate, which also contributes to vehicular emissions. These mechanical emissions are typically considered less important compared to exhaust and evaporative emissions, but they should not be overlooked and in some cases can contribute toxic emissions to the environment. A final factor that determines the amount of emissions from a vehicle is vehicle aging. Vehicle aging will impact exhaust, evaporative, and mechanically induced emissions. As would be expected, the air/fuel management systems, exhaust emission control systems, and other mechanical systems in vehicles wear down and operate less optimally as a vehicle ages. This wearing almost always results in increased emissions. Contaminates in the fuel can hasten the process. Lead permanently destroys a catalyst and fouls the sparkplugs. Sulfur reduces the effectiveness of the catalyst as does methylcyclopentadienyl manganese tricarbonyl (MMT) sometimes used in place of lead. 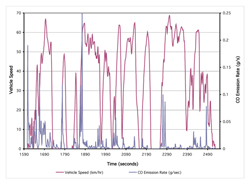 It is common to apply a linear deterioration rate to tailpipe emissions from on-road vehicles. This is the approach used by the USEPA in its original AP-42 emission factors. Table 6.2.1-11 shows the predicted increase in emissions compared to new vehicle emissions for the first 161,000 kilometers of vehicle use based on the US EPA, AP-42 emission factors. It is not recommended that the deterioration rates shown in 6.2.1-11 be used for any serious calculations. They are shown to illustrate the extent that emissions tend to increase as a vehicle ages. It should also be noted that the actual emissions for a fuel injected vehicle with a catalyst even with the large deterioration shown in 6.2.1-11 is still less than the carbureted vehicles. Most vehicle emissions models incorporate some factor to account for the increased emissions as vehicles age. The IVE and CMEM models address vehicle use by creating three vehicle use groups based on the number of kilometers that the vehicle has been operated. In the case of the IVE model, low use vehicles are those operated for fewer than 79,000 kilometers. High use vehicles are those operated for more than 161,000 kilometers. Medium use vehicles are those that fall in between low and high use. Other models used in the US use complicated regimes that account for the effects of inspection and maintenance programs, tampering to the control systems, and normal deterioration of vehicles and emissions control systems. These require extensive surveys and testing to determine the rate of overall deterioration for various vehicle types. Concern over global warming has been increasing over the past twenty years. The emissions from on-road vehicles that contribute to global warming include carbon dioxide (CO2), methane (CH4), and nitrous oxide (N2O). Methane (CH4) is less significant in the case of diesel or gasoline vehicles but should still be considered. Natural gas vehicles produce about ten times more methane than do gasoline or diesel vehicles. Nitrous Oxide (N2O) is produced in the engine and in the catalyst. Thus, catalyst vehicles typically produce more nitrous oxide than do their non-catalyst counterparts. However, the advantages of catalyst for the reduction of urban air pollution has been considered more important to date than the modest increases in N2O caused by the catalyst. The major contributor to global warming from fossil fueled vehicles is carbon dioxide. The amount of carbon dioxide in the exhaust is a direct result of fuel use, which is impacted by engine design, control systems, vehicle size, vehicle maintenance, and driving patterns. However, the predominate factors that determine CO2 emission rates are the engine size and design and the type of fuel used. All carbon based vehicle emissions are eventually oxidized to Carbon Dioxide. Thus, CO and VOC emissions should be considered in calculating total CO2 emissions for global warming purposes. The higher the fuel efficiency of a vehicle, the lower the fuel use and thus CO2 produced by the vehicle for the same trip. Normal gasoline vehicles operate at a fuel efficiency of about 23%. This means that 23% of the energy in the fuel is turned into mechanical energy to move the vehicle. About 77% of the energy in the fuel is wasted. Diesel engines (compression ignition engines) typically operate at much higher compression ratios compared to gasoline engines and thus often realize about a 33% fuel efficiency. This is indicating the reason that most truck fleets prefer diesel engines. 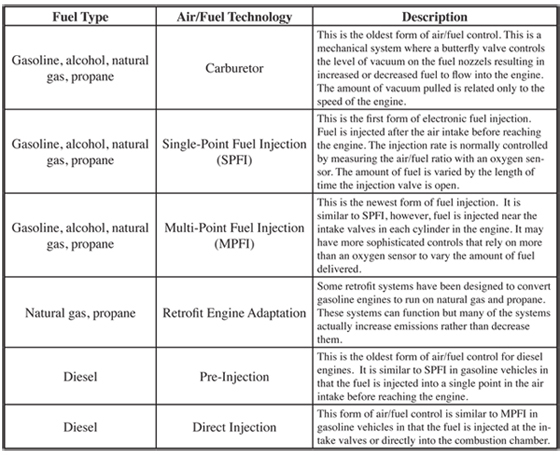 The use of computer controlled multi-point fuel injection has modestly increased fuel efficiency for gasoline fueled vehicles. Thus modern vehicles get better fuel economy than carbureted vehicles if the other operating parameters of the vehicle are kept the same. Vehicle size has increased significantly in the United States in the 1990s, which has mitigated the increased fuel efficiencies derived from fuel injection and transmission improvements. To improve the efficiency of gasoline-fueled vehicles, the hybrid vehicle has been introduced. The present hybrid vehicles use a small gasoline engine in combination with an electric motor and batteries. The electric motor and batteries help the vehicle to accelerate as the vehicle first starts to move. This allows the use of a smaller, more fuel efficient, engine in the vehicle and for the engine to be operated in a narrower power band, which also increases operational efficiency. Finally, when the vehicle is being slowed down or is going down a hill, the electric motor can be used as a generator to recover some of the energy used to put the vehicle into motion or to get the vehicle up the hill. This stored energy can then be used to accelerate the vehicle later. Overall, a gasoline hybrid vehicle can realize about the same fuel efficiency as a diesel fueled engine. Of course, a diesel-fueled hybrid might do even better. On-road vehicles can also produce significant amounts of toxic gases. The most important are Lead, 1,3 Butadiene, Acetaldehyde, Formaldehyde, Ammonia, Benzene, and Diesel Particulate matter. Of course, lead is only a problem if it is used in the fuel. While not a specific compound, the USEPA has recently declared that the substances found in diesel-combusted particulate matter are a suspected carcinogen while the California Air Resources Board has declared diesel particulate matter as a known carcinogen. This has raised the level of awareness and has promoted accelerated action to reduce tailpipe particulate matter emissions from all diesel-fuelled on and off road vehicles. Other vehicle related toxics, such as the aldehydes, are associated with the tailpipe VOC or hydrocarbons emissions. Thus in these cases, the amount of hydrocarbon emissions can serve crudely as a surrogate for toxic gas production in a vehicle. This is a useful relationship because it is expensive and more difficult to measure specific toxic compounds compared with the overall hydrocarbon emissions. The result is that the same factors that increase the amount of hydrocarbons in the exhaust will have a tendency to increase the amount of toxic emissions in the exhaust; although, this rule is not rigid. The major vehicle factors that impact the emission of toxic gases from a vehicle are engine design, vehicle maintenance, and driving patterns. In summary, the emissions from a vehicle come from a variety of sources, including the vehicle’s engine, fuel tank, tires and brakes. The engine emissions due to vehicle activity are highly variable, and driving behavior can have a major impact on these emissions. Vehicles emit more when the engine and catalyst systems are first started. These are often referred to as start-up emissions and the amount of start-up emissions are dependent upon the ambient temperature and time the engine has been turned off (soak time) and thus cooled off. It is common to treat start-up emissions as a separate category of emissions compared to running emissions since different approaches are required to estimate them. The engine technology, particularly the air/fuel delivery technology, and catalyst and other control systems impact the amount of emissions released through the exhaust system, as well as the system deteriorating over time. Evaporation and tire and brake wear are important considerations when evaluating the overall environmental impact of on-road vehicles.